In todayʼs market, music production is constantly evolving. Producers, composers, musicians and artists alike need professional sounding plug-ins that are simple and easy-to-use ! 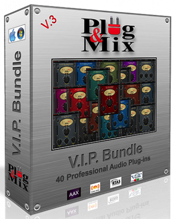 The P&M audio plug-in series delivers the same professional sound you would come to expect from other major plug-in manufacturers, but they are much easier to use. Designed with an emphasis on quality and simplicity, each plug-in has a clean interface with only the most essential knobs and switches needed to dial a great sound.